North Carolina’s junior senator Thom Tillis sat down with Spectrum News reporter Tim Boyum the other day for a discussion of climate change (plus some other issues) and, as is so often the case with Tillis, watching the video provides for a maddening experience. During this week’s interview, Boyum cited the two contradictory instances and also noted actions in the Senate in which Tillis has signed on to a resolution that acknowledged climate change as real, but denied the human role, and another in which he urged President Trump to renege on the Paris Accords that seek to attack climate change. Boyum then, quite generously and gently, asked him about the “evolution” in his position and, amazingly, Tillis refused to acknowledge there had been any such evolution, i.e. a flip-flop. Instead of acknowledging it directly, he simply appears to mumble “Yeah I don’t know” and then immediately pivots into talking about things that people in the military and business have told him about the obvious reality of climate change and the need for us to change human behavior. He even alludes to the scientific reality of ozone layer depletion, says it plays a role in climate change, and describes his recent conversation with some young people about that fact. But, of course, ozone layer depletion dates back many decades. Why didn’t he mention that in 2014? Happily, though, he then, he goes on to actually talk with some conviction about the need for moving toward alternative, sustainable energy and even defends North Carolina’s “renewable portfolio standard” that has been incessantly attacked by his fellow conservatives. 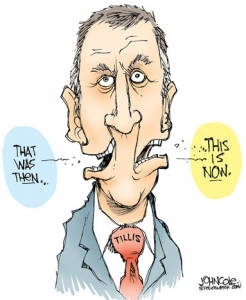 Unfortunately, just when one is ready to get excited that Tillis has mustered some guts to speak the truth, he lapses into an absurd attack on President Obama and the Paris Accords and then concocts an imaginary and powerful group that supposedly wants to do away with all carbon emissions. To which all a caring and thinking person can do and say in response is to sigh, slap one’s forehead and at least be thankful that the man has come this far. Lord knows, given the extremist positions espoused by many of his fellow conservatives, it could be a lot worse. That said, given Tillis’ penchant for 180 degree political pirouettes, more dispiriting moments are likely right around the corner.